1. Clean any grizzle, and extra fat from the chicken thighs, and place them in a bowl. 2. In a separate bowl, mix up the rub. 3. Pour 2 or 3 tablespoons oil on the chicken, then dump on the rub. You want the thighs to be quite oily, and well coated with the rub. 4. I cooked these on my charcoal grill, using a mix of briquettes, and charcoal chunks. The chunks gave a nice smokey flavor to the chicken and the briquettes kept the heat longer. 5. I ended up cooking these for about 45 minutes, covered, over a medium low heated grill. You cooking time may vary based on the temperature of the grill, and the thickness of the chicken. 6. Since I had some of my Asian / Orange BBQ Sauce open, I coated the chicken with a little of it during the last 10 minutes of cooking time. Ron's Note: Gadgets come from a lot of places. I use a bar, mixer, pourer to hold and apply any sauces. If I had the sauce in a bowl or a jar, I would be contaminating it by continuing to dip my brush in it. This way, I can just put the cap on, and put it back in the refrigerator. 7. 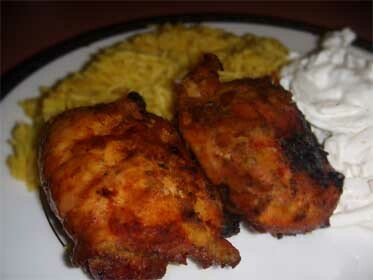 I served these with Curried Rice, and Cucumbers and Sour Cream.